I’m back on my little blog after being MIA for almost a year! Yikes, that year slipped by! I’ve been a busy girl in that time and wrote a book. Yep, a book! I’m so excited and very proud with how it’s turned out but I can’t say much more for now except to say that it will be released later this year and I will pop back with more details soon. I can’t wait to share! In the meantime, here’s a free pattern for you. I’ve been having so much fun making these feathers. 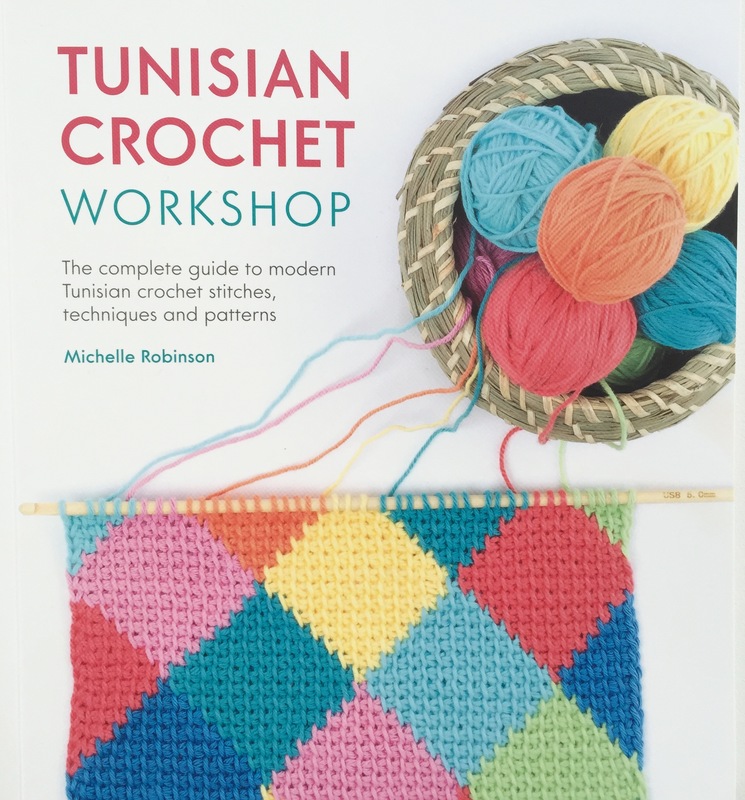 They’re easy and quick to make and easily achievable with only just the basic knowledge of Tunisian crochet. The following instructions are for the design pictured above (the little guy sitting out on his own) but you can go to town with as many colours as you like (or could be bothered weaving in the ends of ), mix up the stripe sequence as you please. There are so many possibilities! Check out the photos throughout this post for inspiration. Carry yarn between rows if there is only a few rows between colour changes. If there are more than a few rows, then it’s best to cut yarn and rejoin. * a nicer edge is achieved for this design by working into the top loop instead of working from the usual back bump. Row 21: Tss3tog, work end st (3 lps). Return: – draw yarn through all 3 lps on hook. Ch 6, sl st back down along chain. Fasten off. Pattern note: The following pattern doesn’t include colour change instructions. Row 15: Tss3tog, work end st (3 lps). Return: – draw yarn through all 3 lps on hook. Ch 6, sl st back down along chain. Fasten off. There are no rules here. 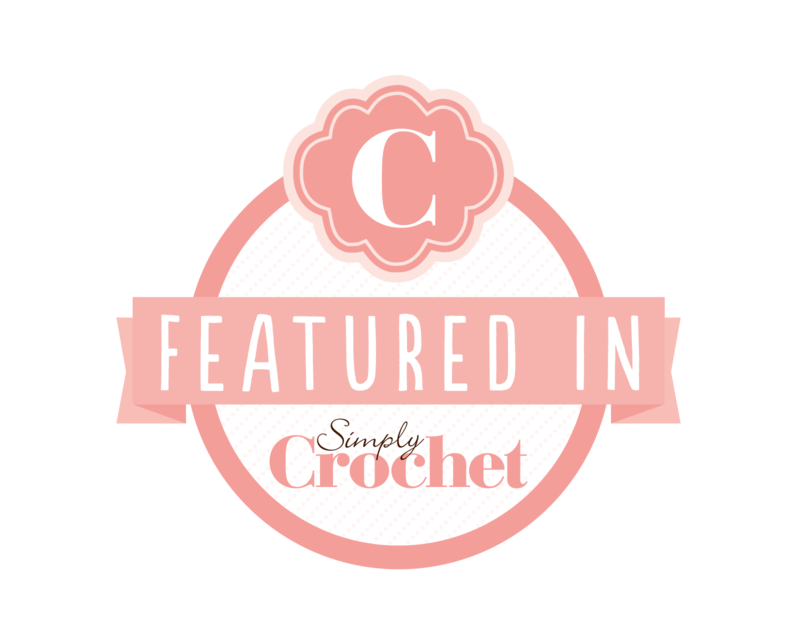 I’ve mainly used long stitches following the natural slant of the crochet rows and the occasional loopy stitch (I’m no embroiderer). You could also weave your yarn under the vertical bars for another interesting effect. Have fun experimenting! Use them as an applique motif on blankets, clothing, cushions ..
p.s. edit: Thank you everyone for the overwhelming love this post has received. There has been lots of requests for the mandala to make the dreamcatcher and also for a video tutorial for the feathers. In answer to your requests – I’m very sorry but I won’t be doing a video for this free pattern. I will publish the mandala pattern at a later date but for now I am busy with other commitments and won’t have time just yet. Please respect my rights as the designer of this pattern. This pattern may not be reproduced in any way for distribution, sale or for teaching purposes. Hooray! I’ve finally finished writing up the pattern for my new blanket – Tunisian Sunset. Isn’t she pretty! If you follow me on instagram you would’ve seen her in the making and I just loved every colourful minute of making this one. All those pretty sunset-ty colours just make my heart sing and dream of happy sunny places far far away. It’s quite an easy make – using only Tunisian Simple stitch and a clever, almost invisible join-as-you go technique. 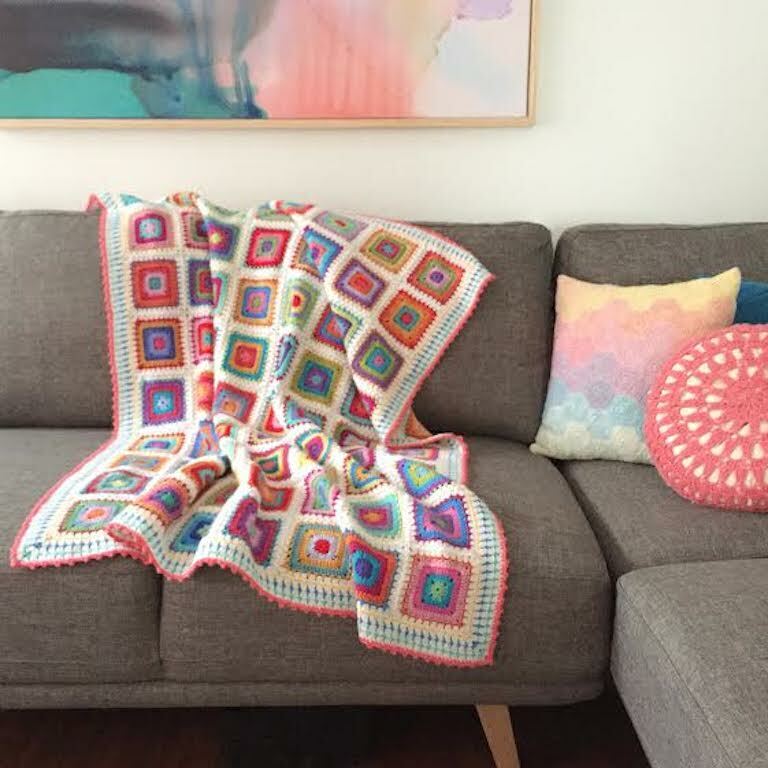 It’s also the perfect project to pick up in your spare moments and complete a square here and there and before you know it, you’ll have a finished blanket. Oh! and it’s a great pattern for stash-busting too. Here’s another version I’m working on using up all my bit’s and bobs of DK yarn. The squares are slightly smaller in this one but the technique is the same .. 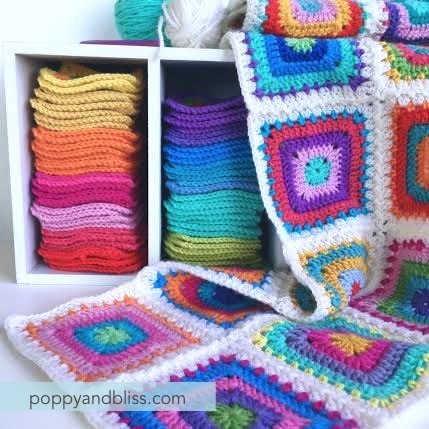 If you’ve never tried Tunisian crochet before but would love to have a go at making this blanket (go on … you know you want to 😉 , I have a tutorial on how to do Tunisian Simple Stitch over here at My Poppet blog. Once you’ve mastered this stitch you’re good to go and will have found a new craft addiction too! You may remember me showing you this pattern that I was working on way back here. Also – I haven’t had this pattern tested externally so please do let me know if you spot any errors. Edit – 3/5/16: there was a small error in round 2 which has now been fixed. 8ply/DK yarn: I’ve used Cascade Ultra Pima cotton in Sunshine, Honeysuckle, China Pink and Cool Mint but any yarn will do. With just 4 colours you can get at least 24 different colour combinations. I’ve used the same colour in Rounds 1 & 6 giving you even more (don’t ask me to do the math – too hard! 😉 . Check out this site for a great formula for creating unique colour combo’s. Long DC (tr): Worked the same as a regular dc (tr) but into a stitch further down in the previous round. Keep your tension on the looser side and draw the stitch up so that it is even with the rest of the stitches in current round. Popcorn: Work 3 dc (tr) into same stitch, drop the loop off your hook and re-insert hook under the top 2 loops of the first dc (tr) in the group, grab the dropped loop with your hook and pull back through the stitch, ch 1 to secure. Round 3: Join Colour C into top of first cluster st of previous round, ch 1, sc into same st, make a long dc into the base of the same cluster st, *sc into top of next cluster st, long dc into base of same cluster st . Repeat from * to end Join with a sl st into top of first sc and fasten off. Round 4: Join Colour D into top of first long dc from previous round, ch 1, sc into same st, make a popcorn in the next st , * sc in next st, popcorn in next st. Repeat from * to end. Join with a sl st into first sc and fasten off. Round 5: Join Colour A into the first sc between popcorns of previous round, ch 1, sc into same st, ch 3, * sc into next st between popcorns, ch 3. Repeat from * to end. Join with a sl st into first sc. Don’t break off yarn. * if you’re making a hexi scroll down to Hexi instructions for Round 6. Round 6: Sl st into first ch space, [ch 3 (counts as first dc), 2 dc, ch 2, 3 dc] into same sp, 3 dc into next two spaces, * [3 dc, ch 2 , 3 dc] into next sp, 3 dc into next two spaces. Repeat from * to end (4 corners & 2 sets of 3 dc between). Join with a sl st into top of beginning ch-3 and fasten off. Round 7: Join White into any corner sp, [ch 3 (counts as first dc), 1 dc, ch 1, 2 dc] into same sp, dc into next 12 sts, * [2dc, ch 1, 2 dc] into corner sp, dc into next 12 sts. Repeat from * to end. Join with a sl st into beginning ch-3. Fasten off and weave in ends. Round 6: Sl st into first ch space, [ch 3 (counts as first dc), 2 dc, ch 2 , 3 dc] into same sp, 3 dc into next sp, * [3 dc, ch 2 , 3 dc] into next sp, 3 dc into next sp. Repeat from * to end (6 corners & 1 set of 3 dc between). Join with a sl st into top of beginning ch-3 and fasten off. Round 3: Join Colour C into top of first cluster st of previous round, ch 1, dc into same st, make a long tr into the base of the same cluster st, * dc into top of next cluster st, long tr into base of same cluster st . Repeat from * to end Join with a sl st into top of first dc and fasten off. Round 4: Join Colour D into top of first long tr from previous round, ch 1, dc into same st, make a popcorn in the next st , * dc in next st, popcorn in next st. Repeat from * to end. Join with a sl st into first dc and fasten off. Round 5: Join Colour A into the first dc between popcorns of previous round, ch 1, dc into same st, ch 3, * dc into next st between popcorns, ch 3. Repeat from * to end. Join with a sl st into first dc. Don’t break off yarn. * if you’re making a hexi scroll down to Hexi instructions for Round 6. Round 6: Sl st into first ch space, [ch 3 (counts as first tr), 2 tr, ch 2 , 3 tr] into same sp, 3 tr into next two spaces, * [3 tr, ch 2 , 3 tr] into next sp, 3 tr into next two spaces. Repeat from * to end (4 corners & 2 sets of 3 tr between). Join with a sl st into top of beginning ch-3 and fasten off. Round 7: Join White into any corner sp, [ch 3 (counts as first tr), 1 tr, ch 1, 2 tr] into same sp, tr into next 12 sts, * [2tr, ch 1, 2 tr] into corner sp, tr into next 12 sts. Repeat from * to end. Join with a sl st into beginning ch-3. Fasten off and weave in ends. Round 6: Sl st into first ch space, [ch 3 (counts as first tr), 2 tr, ch 2 , 3 tr] into same sp, 3 tr into next sp, * [3 tr, ch 2 , 3 tr] into next sp, 3 tr into next sp. Repeat from * to end (6 corners & 1 set of 3 tr between). Join with a sl st into top of beginning ch-3 and fasten off. I hope you’ll enjoy making these sweet motifs. I was given some Ribbon XL yarn to try some time ago by the lovely Gwen from Hoooked and have finally had the chance to have a little play with it. I’m on an organising kick at the moment and needed some pretty storage solutions to control my mess (ahem … creativity 😉 so these handy little baskets were just the thing I needed and are the perfect size for storing all your bits and bobs. I’m hanging mine on my pegboard but they can be hung anywhere you like. Made in my favourite stitch, the Linen Stitch, which gives them a wonderful woven texture. I’ve included instructions for a basket with a contrast band around the top or you can change colour in any round to make your basket your own. Worked in spiral rounds. Place marker in first st of each round, moving marker up as you go. Round 7: sc (dc) into first st, * ch 1, sc (dc) into next ch sp. Repeat from * to end. Rounds 8 – 10: Work as for Round 7. Change colour at the end of Round 10 (when you have 2 loops left on your hook for the last st, yo with new colour and pull through to complete st). Fasten off main colour. Handle: 5 sc (dc) over ch sts from previous round, join with a ss into next sc (dc) of previous round. Fasten off and weave in ends. It’s good to be back after a longer-than-planned break. It’s been a super busy few months and I really needed to switch off from the world for a couple of weeks to recharge my batteries. A new pattern is being born. Pattern writing is nearly done and then it’s off to be tested. Being watched over by these cute puppy dog eyes whilst I stress out over deadlines for some secret projects. Oops! Accidentally started a big project. A Tunisian ripple blanket just has to happen! Challenged myself to keep up a year-long project with a temperature blanket. Will do another post on this later. I’ll be back soon with more. Can you believe it’s nearly Christmas !? Nope. Me either! My head is still firmly stuck way back in June somewhere and I’m not at all ready to start thinking about Turduckens or Christmas cheer. Despite my un-christmasy mood, I’ve put together a quick and easy pattern for you to deck your halls (or tree). Small amounts 8 ply/DK cotton yarn. I’ve used various brands from my stash but a stiffer cotton works better than a soft cotton for these. 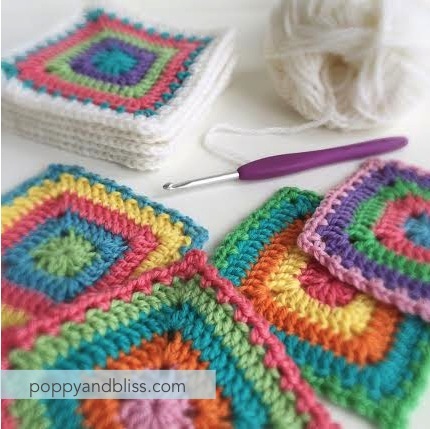 Tip: You can use any weight yarn for these but they will turn out a different size. Use a hook smaller than you normally would for your yarn so that your work is nice and firm. Row 2: Turn work upside down and work into bottom loop of ch, hdc (htr) up to last st, 4 hdc (htr) into last st. Join with a ss into top of beginning ch-2. Fasten off and weave ends in. Round 4: * skip one st, sc (dc) into next st. Repeat from * 5 more times, stopping half way to insert stuffing (roll long yarn tail into a rough ball shape and squish into half closed ball. Use the blunt end of your hook to help push it all in before you finish closing). Join with a ss. Fasten off and bury yarn end back up through centre of ball. Clip closely. Step 5: Take your needle up through the first layers, pick up your next bauble and run needle up through the centre and then through the next set of layers. Continue joining together this way until all baubles are attached. Step 6: Give the tail end a little tug to tighten (don’t pull too hard or you’ll squish your baubles out of shape). Step 7: Make a hanging loop with the remaining yarn by going back down through the centre of the top bauble and make a few small stitches into the bottom of the bauble and the top layer of the tree to secure. Give your tree a little ‘foof’ and hang for everyone to admire. As promised last week, I’m back with a creative challenge and a ‘pattern of sorts’, or as I prefer to think of it, a ‘recipe’. 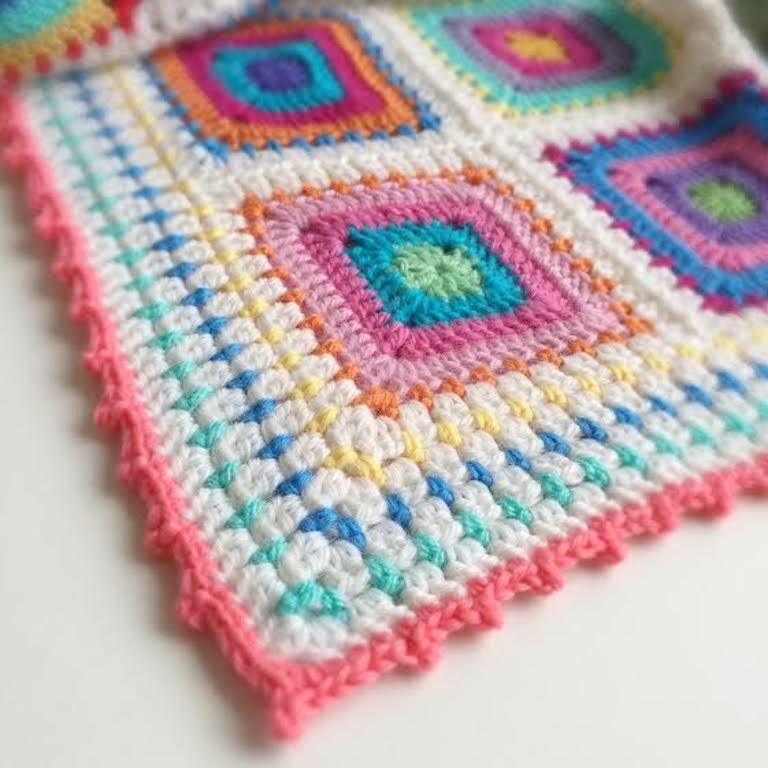 I’m calling it a recipe rather than a new pattern as it’s nothing new, just a standard solid granny square to which I’ve added other elements (also nothing new) to give it a little twist. Here’s where the creative challenge comes in; I’ve written out the instructions for just the square but I want to encourage you to then make it your own by adding your own special touches. Let your imagination run wild with this. 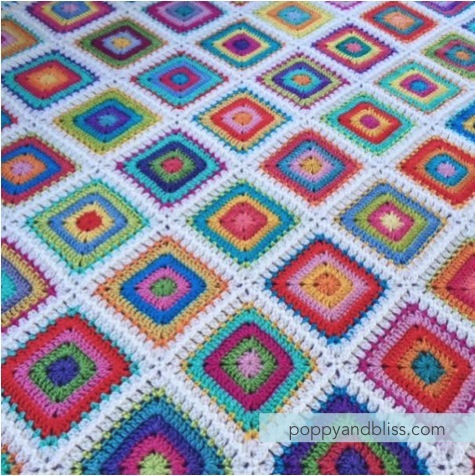 Use up all your scraps, play with colours, make it a riot of colour or monochromatic, make it smaller or bigger, try out a new border, use your favourite joining method to make a blanket, a bag, a cushion, a coat or even a thingy-ma-jig. This is not a competition but a fun exercise to get your creative juices flowing. Let go of all expectations, try something you normally wouldn’t and see where it takes you. Sometimes the most pleasant surprises come from not overthinking a project, not worrying about using exactly the same yarn as the designer or not fussing about colour placement. I’ve deliberately not thought too much about mine and the whole point of starting my project was to use up all my scrappy bits of yarn (didn’t work btw – I seem to have just as many, if not more now :). I didn’t worry about colours going together but just used whatever I happened to pick up next. Admittedly, I’m not fond of some of the colour combo’s but in the whole scheme of things it all just works so I’m letting go of my usual fussiness here. Round 1: Ch 5 (counts as first dc (tr) + 2 ch throughout). [3 dc (tr) into ring, ch 2] 3 times. 2 dc (tr) into ring, join with a sl st into 3rd ch of starting ch. Break off yarn. Round 2: Join Colour 2 into any corner sp with a sl st. Ch 5, 2 dc (tr) into same sp. *Dc (tr) into next 3 sts, [2 dc (tr), ch 2, 2 dc (tr)] into corner sp. Repeat from * twice, dc (tr) into next 3 sts, 1 dc (tr) into first sp. Join with a sl st into 3rd ch of starting ch. Break off yarn. Round 3: Join Colour 3 into any corner sp with a sl st. Ch 5, 2 dc (tr) into same sp. *Dc (tr) into next 7 sts, [2 dc (tr), ch 2, 2 dc (tr)] into corner sp. Repeat from * twice, dc (tr) into next 7 sts, 1 dc (tr) into first sp. Join with a sl st into 3rd ch of starting ch. Break off yarn. Round 4: Join Colour 4 into any corner sp with a sl st Ch 5, 2 dc (tr) into same sp. *Dc (tr) into next 11 sts, [2 dc (tr), ch 2, 2 dc (tr)] into corner sp. Repeat from * twice, dc (tr) into next 11 sts, 1 dc(tr) into first sp. Join with a sl st into 3rd ch of starting ch. Break off yarn. Round 5: Join new colour (can be a new colour or one already used ) into any corner sp. [1 sc (dc), ch 3, 1 sc (dc)] into same space, *ch 2, skip one st, sc (dc) into next st. Repeat from * to next corner sp, [1 sc (dc), ch 3, 1 sc (dc)] into corner sp. Repeat this sequence to end. Join with a sl st into top of first sc (dc). Break off yarn. Round 6: Join Main colour into any corner loop, Ch 5, 2 dc (tr) into same sp * 2 dc (tr) into each loop space up to next corner, [2 dc (tr), ch 2, 2 dc (tr)] into corner sp. Repeat from * twice, 2 dc (tr) into each loop space up to starting corner (first sp), 1 dc (tr) into first sp. Join with a sl st into 3rd ch of starting ch. Break off yarn. ** On a side note, although they are perfectly fine for this square, I don’t use Ch3 as my first st or sl st at the end, but replace these with a faux st or invisible join. I’ll be back soon with a tute for both of these techniques. Now let the fun times roll, here’s where you get to put your special touch to this square. Use your favourite joining method and border to make it your own. 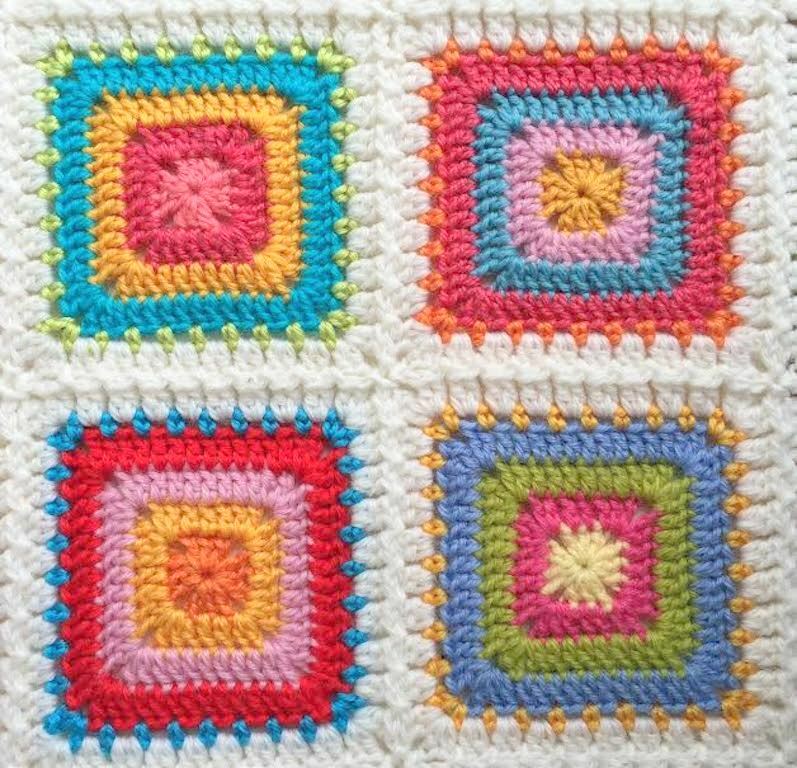 I’ve joined mine with the join-as-you-go method for my blanket but I’m making some more squares for a cushion and will be joining them with different coloured rows of sc (dc). and carried on the block st pattern (rounds 5 & 6) in the border and added a picot edge. I’m very tempted to add pom poms too! I hope you enjoy making Festiva. 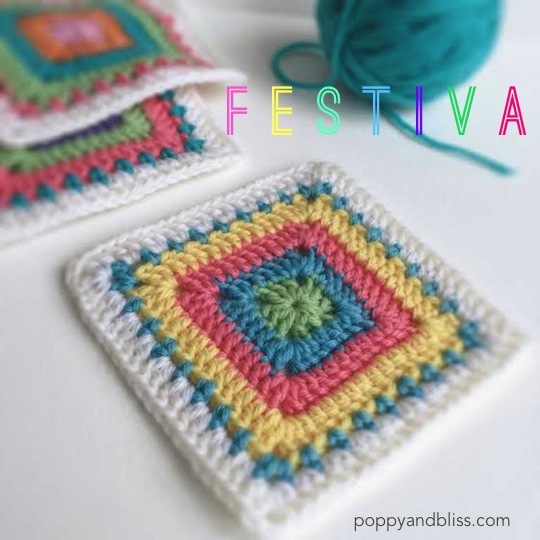 I’d love to see your fab creations so be sure to tag them with #festivasquare on instagram or pop a pic up in my Ravelry group if you prefer. I’d love to see them!